I have the honor to be hosting the March 2015 edition of the Raising Multilingual Children Blogging Carnival. This month’s topic is multilingual resources – I wanted to hear from other bloggers about the various materials that they use for supporting their family languages. I must say that I was a little overwhelmed by the response – I received over 30 submissions! For ease of overview these will be split into two parts. Resources by type contain tips and ideas that are relevant for multiple languages, these are further split into printed and digital resources, whereas resources by language contain more language-specific contributions. Before we peruse the different printed and digital resources, let us look at a few contributions that deal with using such materials practically. In the post 8 Tips for a Bilingual Year Miss Panda Chinese suggests ways of incorporating music and audio tapes, books and board games, playdates and travels, into family’s daily routines thus helping to develop the kids’ heritage language skills. In his post Why Resources in the Minority Language Are So Vital to Bilingual Success, Adam from Bilingual Monkeys reminds: “The more resources you have in the minority language, the more suitable those resources are for the child’s age, language level, and interests, and the more actively you use those resources in the home, the more progress will be made.” Check out his six personal examples about the impact of such various resources as magazines, graphic novels, and music CDs on the minority language use of his kids. It is never too late to start building a collection of various resources and, perhaps, it is never too early either. Third Culture Mama looks back at preparing for the birth of her multilingual baby and lists several great language resources and toys that she wishes she would have acquired earlier (I am currently catching up on her suggestion of buying more picture books). If you are interested in assembling a variety of resources early on, you should take a look at these two great posts on the blog World Languages for Toddlers & Children: My Tips & Top 10 Tools for Raising Bilingual or Multilingual Children Part 1: Babies and Part 2: Toddlers. The suggested resources are mainly in English, Spanish, and German, however the tips and ideas can be easily applied to any language. A shared struggle of parents who live outside their home country is finding books and other printed materials in the language that they speak to their children. Fortunately, several of the bloggers offer some useful tips to make this task a little easier. In the post How To Find Children Books In Your Heritage Language? Olena from Bilingual Kids Rock not only gives great tips for finding books, she also reminds why reading in the minority language is so important: it enriches the vocabulary and introduces new, difficult words, helps to develop imagination, serves as a source for discussions in the minority language, it can also teach about culture, and maybe even contribute to children’s academic success. Julie from the blog Happy Mama = Happy Baby recommends to “cave in” and buy translations of foreign children’s classics, and reminds that translation on the go can be a good alternative when lacking books in the target language. According to Julie’s observations, the number of good quality children’s books increase by age so, if you are having troubles finding baby books, you might just have to be patient. Books in different languages are not only useful for the minority language parent, the Spanish Mama shares four ways how books help her to raise bilingual (English – Spanish) kids despite being a non-native speaker herself. Many of the bloggers clearly state their preference for original books as opposed to translations from one language into another. But, as expressed by Annabelle in her post Why Buy Bilingual Books (or not), translations of familiar stories and bilingual books can have a certain advantage: “Reading the same story to your child in different languages gives them a larger vocabulary and the ability to talk about the same topic (that of the book) in both languages (provided you read the book in both languages – not at the same time).” Take a look at her review of a Portuguese -English book and check out the links to other reviews of bilingual books by other bloggers at the bottom of the post. Last but not least, check out the post Five Recommendations for Choosing Bilingual Baby Books – Year One on the Espanolita blog. Audrey highlights five criteria that a baby book should fulfill and shares some of her favorite books in English and Spanish for each of the criteria. In the post Resources for Multilingual Families Rita from the blog Multilingual Parenting introduces to several great sources for free online books and other materials in multiple languages. My eye was caught by a site called Storybird that allows you to create your own storybook with beautiful illustrations. Check out also this comprehensive list of online books for children in multiple languages on Trilingual Mama that lists both free and paid resources. This list is actually the result of the Multilingual Blogging Carnival of May 2014. YouTube can be a source of great videos for kids that are either in one of your family’s languages or multilingual. In her post Multilingual Frozen Olga from the blog European Mama tells the story of how she used her girls’ love of the song Let it Go from the Disney animated movie Frozen to teach them about different languages. Smartphones and mobile applications are taking a bigger and bigger role in our lives these days. Annabelle from The Piri-Piri Lexicon reviews a few multilingual iPad applications for toddlers and young children (from the age of two). One of the apps that she recommends is in English and French, while the other is available in a total of 12 languages. But what can you do if there are no good mobile applications for children in your language? Take a look at this story of a trilingual family on the blog Raising a Trilingual Child – after having difficulties finding good quality apps that would help their sons to learn Greek, these parents created their own educational app for kids and made it available to others! Finally, if you are interested in other digital resources, you should also check out this Multicultural Kids Blog Carnival that focused on Multimedia for Multicultural Kids on the blog European Mama. On the blog the Piri-Piri Lexicon you can find several reviews for French language resources: a list of favorite children’s books, the Zazoo bilingual book series, the Ernest & Celestine books and animated film, and the Roule Galette story. A list of children’s books in Polish language (by age) on the blog Raising a Trilingual Child. A list of Russian books (by age), as well as cartoons and movies on the blog Raising a Trilingual Child. On the blog Russian Step by Step for Children you can find a list of Russian stories about princes and princesses plus some royal vocabulary, as well as a list of books on the topic of Russian winter, split by ages two to four, and four to seven or older. Take a look also at this fun activity of teaching a child to spell their name in Russian that can be easily adopted in many other languages. Some valuable tips on finding books in Spanish for toddlers on All Done Monkey that also raises the questions of translation quality and differences in regional dialects. On the blog Spanish Playground you can find a list of six Spanish language publishing houses that makes finding good quality children’s books so much easier and 10 search tips for finding Spanish materials online. For those who are interested in Spanish language versions of classic English children’s books, this list of 10 books by Diana aka LadyDeeLG is a good start. Finally, take a look at these great & free downloads for language learning from the Spanish Mama. Last, but not least, take a look at these Pinterest boards for more ideas, tips, tools, and resources for helping you to pass on your family languages! 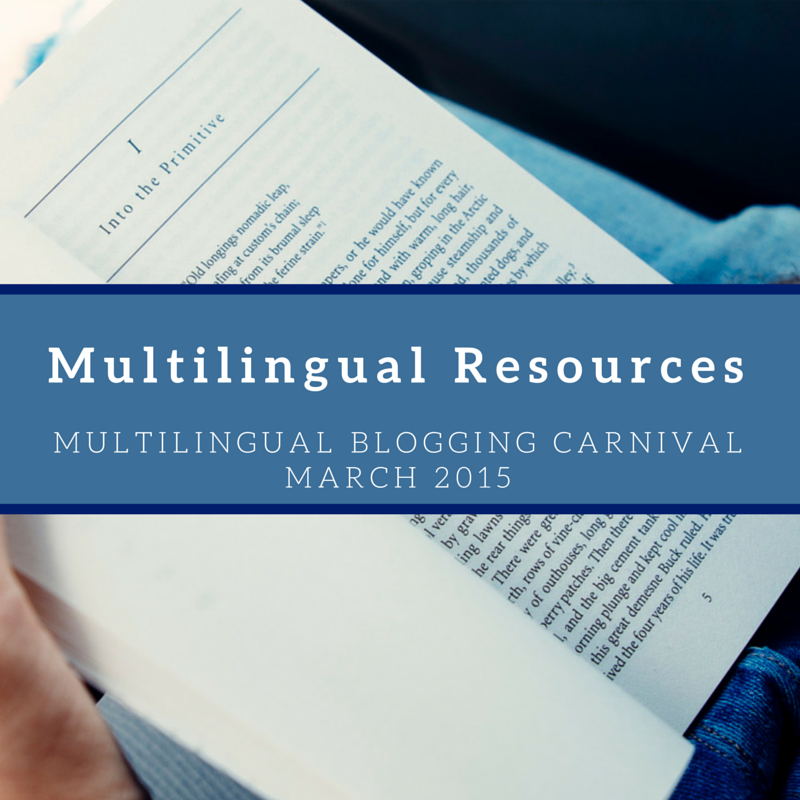 I hope that you have enjoyed this month’s multilingual blogging carnival! If you have more good multilingual resources and ideas to share, please leave a link in the comments.